(Francisco Kjolseth | The Salt Lake Tribune) The body of Utah firefighter Matt Burchett, 42, who died fighting a wildfire in California is honored by a firefighter detail along Murray Parkway as his body is returned home, traveling along I-215 after being flown in to the Utah Air National Guard in Salt Lake City on Wed. Aug. 15, 2018. The remains of the Draper battalion chief were transported to Jenkins-Soffe Mortuary in South Jordan. 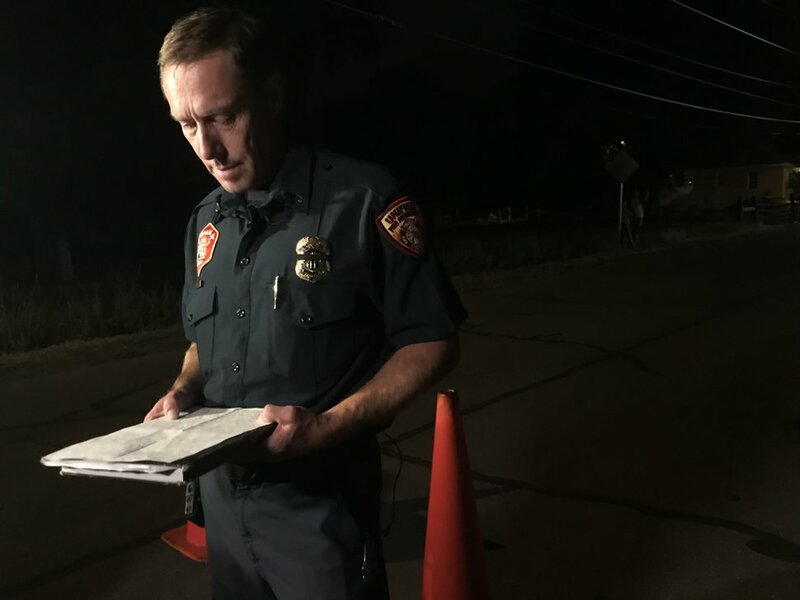 A black hearse carrying the body of Matthew Burchett rolled down a small side street on Wednesday night, heading to the mortuary where his family members would get a chance to say their goodbyes. The procession, led by motorcycles, arrived in South Jordan well after nightfall. Despite a several-hour delay in getting Burchett’s body home, hundreds of supporters — more numerous even than the American flags placed along the route earlier in the day — still lined the road to pay their respects. “This is the only way we can honor him,” said Janice Lukes, who waited for hours near the mortuary for the procession. (Christopher Chung | The Press Democrat via AP) Firefighting personnel from various agencies salute as the procession for Battalion Chief Matthew Burchett travels along North State Street, in Ukiah, Calif., on Wednesday, Aug. 15, 2018. Burchett said goodbye to his wife and 7-year-old son in early August, volunteering to travel with fellow firefighters from Utah to help battle record-setting blazes in California. Burchett was hit by a falling tree and died Monday night while fighting the largest blaze in California history, the Mendocino Complex fire north of San Francisco. (Steve Griffin | Deseret News, pool photo) A C130-J carrying the casket of Draper Battalion Chief Matt Burchett prepares to landa at the Utah Air National Guard Base in Salt Lake City on Wednesday, Aug. 15, 2018. Burchett was killed while fighting the Mendocino Complex Fire north of San Francisco. (Steve Griffin | Deseret News, pool photo) A C130-J carrying the casket of Draper Battalion Chief Matt Burchett taxis through a water arch as it lands at the Utah Air National Guard Base in Salt Lake City on Wednesday, Aug. 15, 2018. Burchett was killed while fighting the Mendocino Complex Fire north of San Francisco. (Steve Griffin | Deseret News, pool photo) Members of the Draper City Fire Department and Unified Fire Authority Honor Guard carry the casket of Draper Battalion Chief Matt Burchett to a hearse after being transported from California to Utah in a C130-J by the California Air National Guard. The C130-J landed at the Utah Air National Guard Base in Salt Lake City on Wednesday, Aug. 15, 2018. Burchett was killed while fighting the Mendocino Complex Fire north of San Francisco. (Steve Griffin | Deseret News, pool photo) Members of the Draper City Fire Department and Unified Fire Authority Honor Guard stand with family members after the casket of Draper Battalion Chief Matt Burchett is placed in a hearse after being transported from California to Utah in a C130-J by the California Air National Guard. The C130-J landed at the Utah Air National Guard Base in Salt Lake City on Wednesday, Aug. 15, 2018. Burchett was killed while fighting the Mendocino Complex Fire north of San Francisco. (Steve Griffin | Deseret News, pool photo) Members of the Draper City Fire Department and Unified Fire Authority Honor Guard stand with family members after the casket of Draper Battalion Chief Matt Burchett is placed in a hearse after being transported from California to Utah in a C130-J by the California Air National Guard. The C130-J landed at the Utah Air National Guard Base in Salt Lake City on Wednesday, Aug. 15, 2018. Burchett was killed while fighting the Mendocino Complex Fire north of San Francisco. (Steve Griffin | Deseret News, pool photo) Members of the Draper City Fire Department and Unified Fire Authority Honor Guard carry the casket of Draper Battalion Chief Matt Burchett to a hearse after being transported from California to Utah in a C130-J by the California Air National Guard. The C130-J landed at the Utah Air National Guard Base in Salt Lake City on Wednesday, Aug. 15, 2018. Burchett was killed while fighting the Mendocino Complex Fire north of San Francisco. (Francisco Kjolseth | The Salt Lake Tribune) The body of Utah firefighter Matt Burchett, 42, who died fighting a wildfire in California is honored by a firefighter detail along Murray Parkway as his body is returned home, traveling along I-215 after being flown in to the Utah Air National Guard in Salt Lake City on Wed. Aug. 15, 2018. The remains of the Draper battalion chief were transported to Jenkins-Soffe Mortuary in South Jordan. (Francisco Kjolseth | The Salt Lake Tribune) The body of Utah firefighter Matt Burchett, 42, who died fighting a wildfire in California is honored by a firefighter detail along Murray Parkway as his body is returned home, traveling along I-215 after being flown in to the Utah Air National Guard in Salt Lake City on Wed. Aug. 15, 2018. The remains of the Draper battalion chief were transported to Jenkins-Soffe Mortuary in South Jordan. (Francisco Kjolseth | The Salt Lake Tribune) The body of Utah firefighter Matt Burchett, 42, who died fighting a wildfire in California is honored by a firefighter detail along Murray Parkway as his body is returned home, traveling along I-215 after being flown in to the Utah Air National Guard in Salt Lake City on Wed. Aug. 15, 2018. The remains of the Draper battalion chief were transported to Jenkins-Soffe Mortuary in South Jordan. 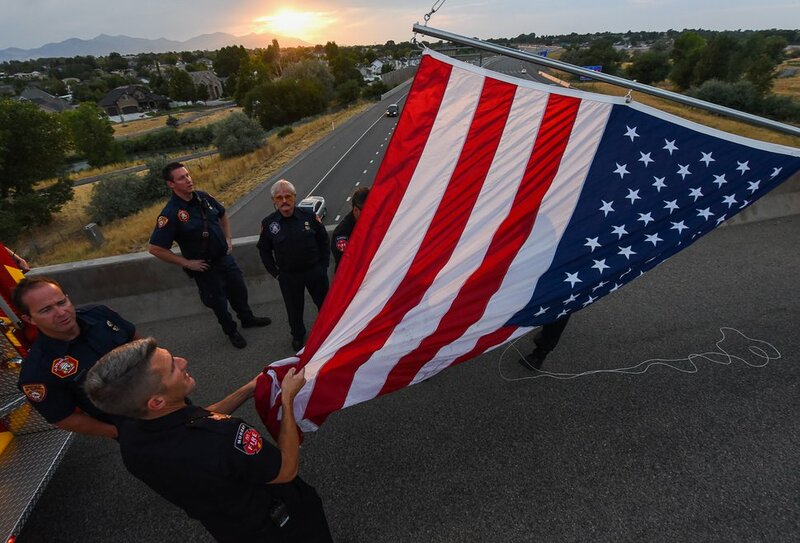 (Francisco Kjolseth | The Salt Lake Tribune) Jason Hawkes with Murray Fire Tower 83, holds a flag to be unfurled over I-215 in Murray in anticipation of the arrival of the body of Utah firefighter Matt Burchett, 42, who died fighting a wildfire in California. Several firefighter details set up along the procession route after being flown in to the Utah Air National Guard in Salt Lake City on Wed. Aug. 15, 2018. The remains of the Draper battalion chief were transported to Jenkins-Soffe Mortuary in South Jordan. (Francisco Kjolseth | The Salt Lake Tribune) The body of Utah firefighter Matt Burchett, 42, who died fighting a wildfire in California is honored by a firefighter detail along Murray Parkway as his body is returned home, traveling along I-215 after being flown in to the Utah Air National Guard in Salt Lake City on Wed. Aug. 15, 2018. The remains of the Draper battalion chief were transported to Jenkins-Soffe Mortuary in South Jordan. (Francisco Kjolseth | The Salt Lake Tribune) A C-130 arrives in the Salt Lake valley with the body of Utah firefighter Matt Burchett, 42, who died fighting a wildfire in California. He was being returned home, arriving at the Utah Air National Guard in Salt Lake City on Wed. Aug. 15, 2018. The remains of the Draper battalion chief were later transported to Jenkins-Soffe Mortuary in South Jordan. 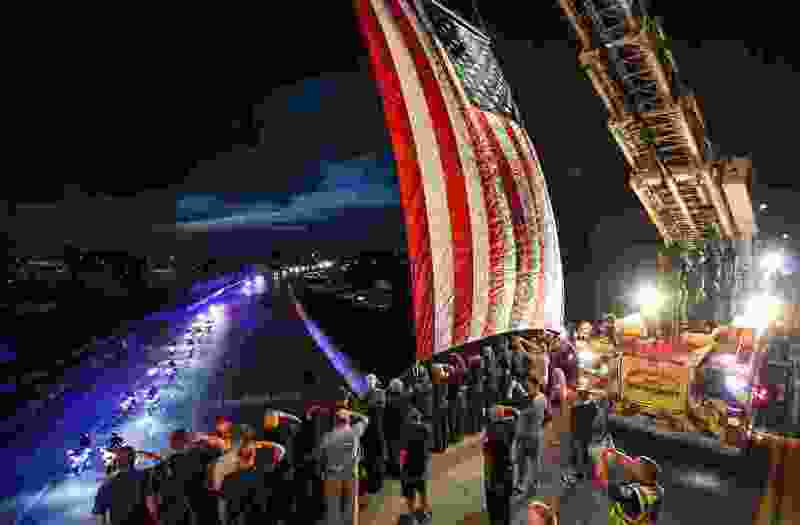 (Francisco Kjolseth | The Salt Lake Tribune) Firefighters unfurl a flag as they get ready to honor Utah firefighter Matt Burchett, 42, who died fighting a wildfire in California. His body was being returned home, to travel along I-215 after being flown in to the Utah Air National Guard in Salt Lake City on Wed. Aug. 15, 2018. The remains of the Draper battalion chief were transported to Jenkins-Soffe Mortuary in South Jordan. (Paighten Harkins | The Salt Lake Tribune) Unified Fire Capt. Jay Torgersen reads a statement from Draper Fire Battalion Chief Matt Burchett's family on Wednesday, Aug. 15, 2018, in South Jordan. It’d been three days since Burchett, a veteran firefighter and battalion chief with the Draper Fire Department, was killed fighting the Medocino Complex fire in California. He was injured when a tree fell on him. He died later, at Ukiah Valley Medical Center. While the loss is still raw, family members said through a spokesman that the outpouring of support helped them grieve. Burchett, 42, was one of five Draper firefighters and other volunteer Utah crews dispatched to California. “It was humbling in the short drive from the airport to here to see that firsthand — thousands and thousands of people paying their last respects,” said Unified Fire Capt. Jay Torgersen, reading a statement from the family. Draper City Fire Department Battalion Chief Matt Burchett begins his Journey Home. Burchett graduated from Judge Memorial High School in 1994, then he began working as a seasonal firefighter with Unified Fire Authority’s wildland division in 1995. He eventually became a full-time firefighter with Unified Fire Authority (UFA) and worked his way up to captain. While he responded to the house fires and medical emergencies every city firefighter does, he also continued battling wildfires, traveling to blazes in California in 2009 and 2016. He worked for the UFA most of his career, and he had more recently started working for the Draper Fire Department. In the statement, the family noted that Burchett arrived in Utah at sunset, a “beautiful” orange and yellow one that he would have loved. (Francisco Kjolseth | The Salt Lake Tribune) Firefighters unfurl a flag as they get ready to honor Utah firefighter Matt Burchett, 42, who died fighting a wildfire in California. His body was being returned home, to travel along I-215 after being flown in to the Utah Air National Guard in Salt Lake City on Wed. Aug. 15, 2018. The remains of the Draper battalion chief were transported to Jenkins-Soffe Mortuary in South Jordan. Torgersen said Burchett was an avid outdoorsman who was out skiing or fishing or hiking across Utah and the West whenever he got a chance. “It was one of the reasons that led him to wildland firefighting,” Torgersen said. The two began their careers together, and Torgersen said the only thing Burchett did better than firefighting was being a father and husband. Burchett leaves behind a 6-year-old son. Torgersen said Burchett’s family wanted to remind everyone to tell loved ones how much you care about them. (Paighten Harkins | The Salt Lake Tribune) Unified Fire Capt. Jay Torgersen reads a statement from Draper Fire Battalion Chief Matt Burchett's family on Wednesday, Aug. 15, 2018, in South Jordan. Standing on the side of the street, Lukes said she can’t imagine what Burchett’s family is going through. She has a friend whose husband volunteers for the same type of work, and she’s seen the sacrifices that family makes when he leaves. She said those firefighters risk so much and go “above and beyond” when they are called to fight wildfires. “I’m sure [the fear of losing a loved one] is always in the back of their minds, but it’s not supposed to happen,” she said. Brooke Westlund was sitting across the street from where Lukes stood. Westlund said she was proud of Burchett and grateful for his sacrifice: one made not for himself or his community, but for fellow Americans who were in trouble.